Dive Damai’s newest vessel, MY DAMAI II was constructed in Tanjung Bira, South Sulawesi by Pak Hadji Baso in 2011. Pak Hadji Baso is one of the most respected master boat builders in the traditional Indonesian boat building community of Bira and was also the builder of Dive Damai’s first vessel; MY DAMAI I. 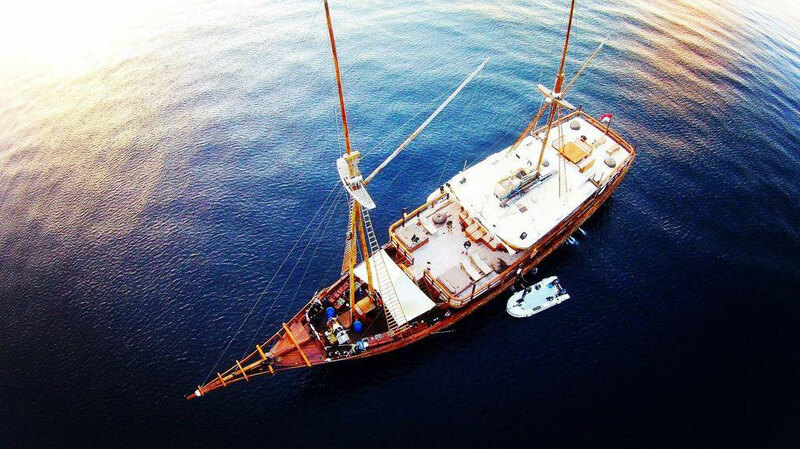 MY DAMAI II has a deck length of 40 meters and a beam of 9 meters at its widest point. It has been built to an uncompromising standard and fitted out with all the latest diving, navigation and safety equipment to ensure that the level of service appreciated on our first vessel is maintained and, where possible, improved upon, including satellite Wi-Fi capabilities. The new vessel is slightly larger than the first ensuring three large outside deck areas with an outside dining facility, our famous massage and spa treatment area and plenty of extra lounging and sunbathing space. The crew to passenger ratio will be the same as our first vessel and we hope the new systems will ensure an even more enjoyable cruise for both our returning and new guests. The below deck accommodation has been designed to accommodate single or twin occupants in a level of luxury not seen on another vessel in Indonesia. Each cabin boasts a private shower and head with a queen-size bed and a separate day bed. The cabins measure approximately 20 sqm (225 sqf) each and have been finished with the highest quality furnishings. The stern staterooms are over 400 sqf each and boast their own private deck with loungers, a super-king size bed, day beds, two desks and en-suite shower and separate head. The dive systems have been made even more accommodating on the new vessel. The dive station is larger and is served by large individuals rinse tanks. The camera room has been enlarged also. The 4 diver to 1 guide ratio that our customers enjoy so much on the MY DAMAI I has, of course, been maintained and we have added 2 custom designed high speed tender boats. Damai II offer guests an outside dining facility, famous massage and spa treatment area and plenty of extra lounging and sunbathing space. Each small details of the boat has been finished with the highest quality furnishings. The main deck has a large & beautiful air conditioned salon/dining area with a flat screen TV, DVD player, sound system, games and a great view. And a professional camera room with shelves and electrical plugs is adjacent to the salon. The bridge deck has a sun deck at the front with chaises lounges and cushioned benches as well as a partially shaded deck at the aft with sofas. Damai II has specifically designed for divers, the vessel offers large dive stations with individual rinse tanks and a camera room with separate camera work stations with integrated 110v and 220v charging station for each photographer. Accommodation with A/C in twin or double bed cabin with en-suite showers and toilet. Air Tanks, weight belt and weights.